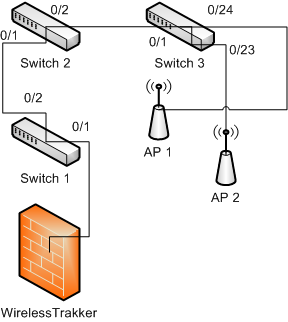 WirelessTrakker requires that the switch ports involved for connecting the components for WirelessTrakker be 802.1q VLAN tagged / trunked ports. These directions tell you how to do that. Note: These were written using a Cisco Catalyst 2950. While this should work for most modern Cisco switches running IOS (as opposed to the older CatOS), some Cisco equipment has small nuances that may be different. To confirm VLAN configuration is correct, type SHOW VLAN, you see something like this, if not, your VLANS are not configured correctly. For Switch 2, both ports involved would have the same configuration as port 0/2 on Switch 1. For Switch 3, port 0/1 would be the same as Switch 1 port 0/2, and Switch 3 port 0/23 & 0/24 would be the same as Switch 1 port 0/1. A helpful hint to help keep your port configuration information straight is to not only save each switch's configuration in a spreadsheet, but also print that spreadsheet and keep it in the wiring closet with each switch. Many people use 8 1/2" x 11" sheet protectors designed to hold a piece of paper in a binder, and hang them right from the rack...one per switch. This is especially useful with bigger networks that use larger switches with >100 ports on them, each with a potentially different configuration.